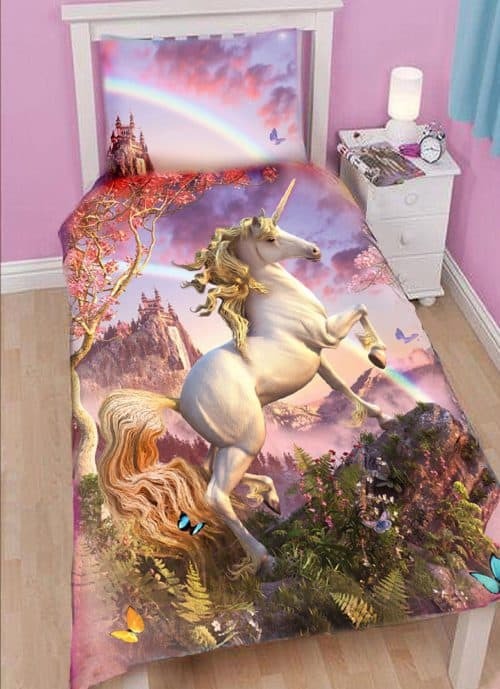 Unicorn Themed Bedroom Ideas! Ultimate Magic! 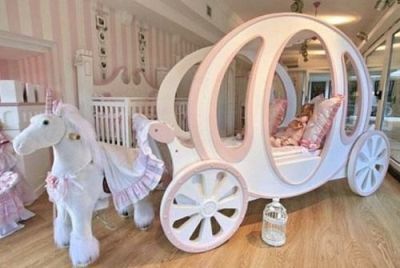 Unicorn Bedroom Ideas – For Kids! I’m really excited to write this post today, because I’m such a Unicorn fan myself. While I do remember being somewhat frightened by this film, (the bad guy in this is really quite terrifying) I still remember being mesmerised by the Unicorns and how beautiful they were. You can actually watch the full length version on YouTube here. I love the fact that I can now share and enjoy the films I loved as a child with my own children too! 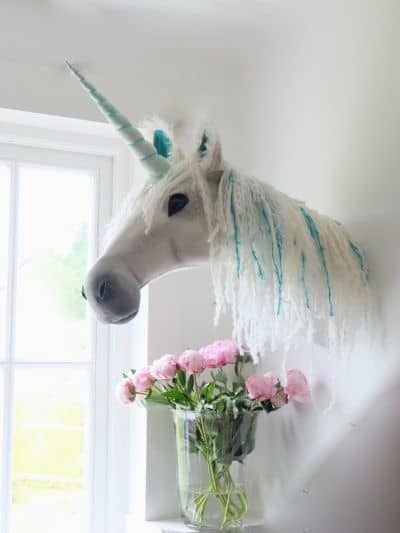 In any case, I’ve been thinking about the potential of a unicorn themed bedroom recently, ever since I first discovered some wonderful unicorn fauxidermy wall heads. So, this post has certainly been quite a long time coming. 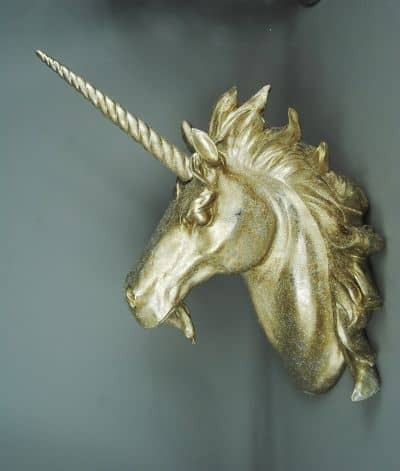 Check out some of these Unicorn related products – and let me know what you think. Unicrorn duvet – Unicorn related beds are hard to come by, (unless you go for custom made). But you can certainly accessorise using related themed bedding. There are some beautiful and realistic choices available. 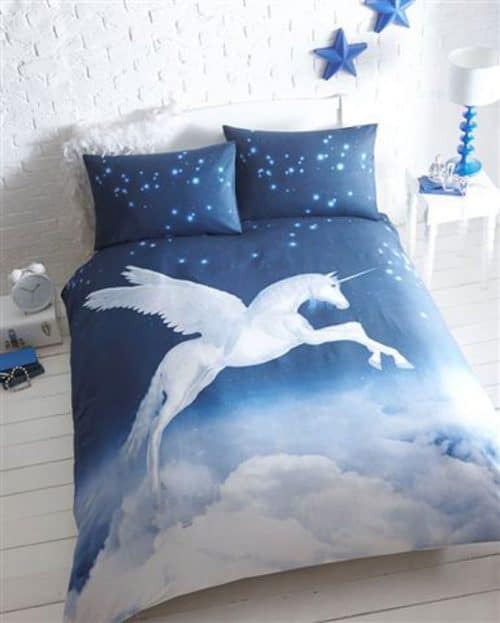 Blue mystical Unicorn duvet – here is a second duvet, with fluffy clouds and stars and a beautiful Unicorn flying through the air. 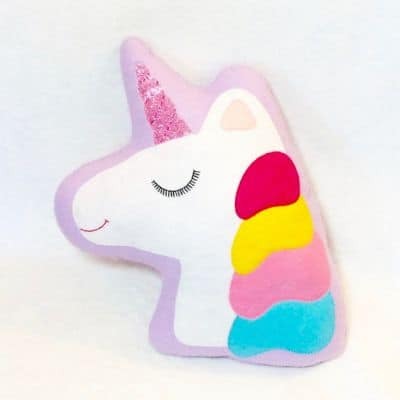 Unicorn Cushions – So Cute! Cushions are a great accessory if you’re trying to add more to a themed room – as they don’t cost much but can make a big impact. 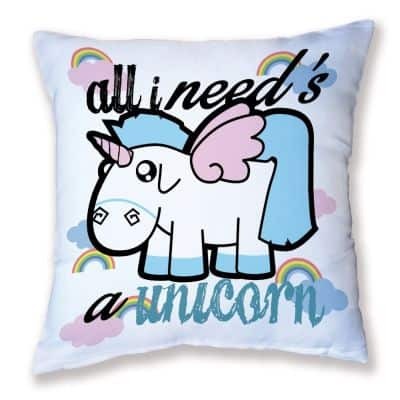 Here are some of my favorite unicorn cushions that I have discovered…. I love this humorous unicorn pillow with a funny message and plenty of color and glitter! Or, how about this gorgeous and colorful rainbow horned Unicorn head…. Isn’t she cute? Note: the above pillow is extremely popular! One of the most popular items I’ve ever written about and I can completely understand why – sadly out of stock, but find more here. Fabulous Unicorn sequin cushion here…Using sequins that can be reversed and customized to suit you. I love the way you can push all the sequins up in a sweeping motion and completely change the look! Free shipping worldwide, you can customize the cushion in any name you choose. I couldn’t resist this one… part cat, part unicorn!! 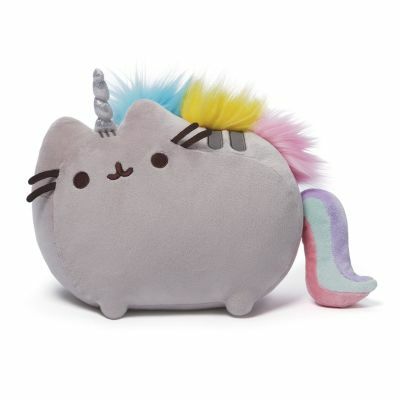 I absolutely love this Pusheenicorn pillow and any combo unicorn and cat lover would surely feel the same. Look at the cute rainbow tail and fluffy multi-colored fur…. Cute cartoon style unicorn with rainbows and “all I need’s a unicorn,” written on the front. Don’t we all just need a Unicorn? I enjoy the style of this one. Unicorn head shaped pillow with pink glitter sparkly horn! I love this one, especially that glitter horn! But her multi-colored hair is brilliant too. This item is homemade and ships from the UK. A very pretty unicorn head pillow, embroidered with white cotton fabric. This cushion can also be embroidered with a name; simply contact the creator at the time of purchase. This has more of a grown up, romantic style to it I think. 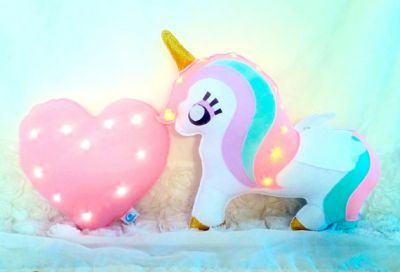 Super duper Unicorn pillow, with integrated pretty lights – the lights do not warm up and so are safe to keep on! There are more pictures to it via the link above and you will see, they’re larger than they look! One of these would make a great night light for younger children – or simply a cool cushion for older kids and teens! 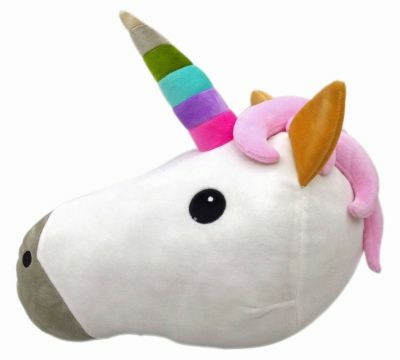 Last but not least – the unicorn PUG pillow! If you’re a lover of both pugs and unicorns, (like I am)- then you can’t go wrong with this. I am also thinking some of these pillows would make great gifts. 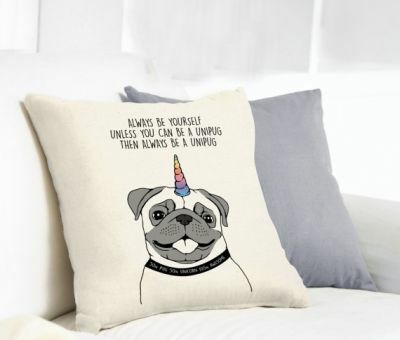 Unicorn Pug “Unipug” Cushion Here! From the highly realistic, to just plain comical. The range of fauxidermy wall heads on offer now is quite extensive. A while back, I dedicated a post exclusively to some of these fauxidermy toy heads and there are various animals available – but unicorns really work for this! With my choices, I’ve gone for the more realistic variety – but ETSY in particular have a very large selection. Here are some of my favourites…. When I first discovered this “fauxidermy,” I wasn’t completely convinced – but they quickly grew on me and I do really like them now. You can really find some unique pieces now and their popularity seems to be on the rise. Don’t forget also to think about Unicorn Wall Stickers as a great option for creating a themed bedroom. Wall stickers are simple to apply and most can be easily removed without leaving any marks. Some wall stickers can also be reused! If your child likes to change the style of their room regularly, using wall stickers provides that opportunity, because they’re affordable and so easy – yet can make a big impact. I love these open-effect wall stickers, they can create quite an amazing effect for such little effort and cost. 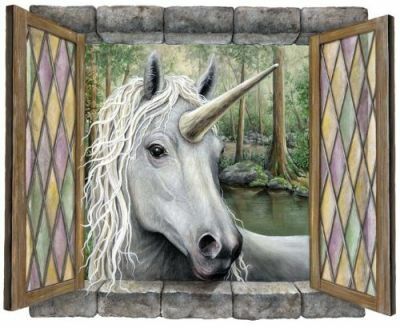 Unicorn window wall Sticker here! 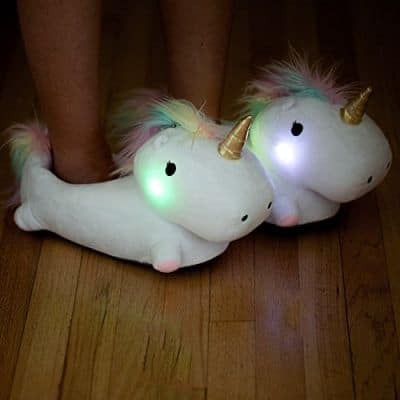 Surely these Unicorn Slippers that LIGHT UP are pretty much an essential item too? 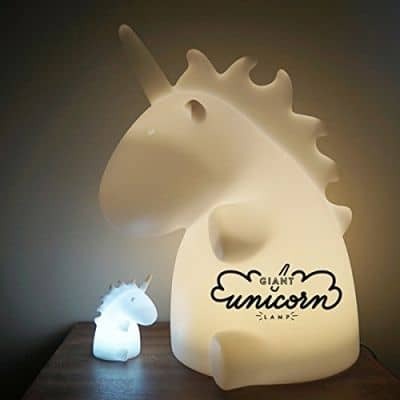 I love these beautiful unicorn lamps – giant and small available. They can change into multiple different colours and also have alternative settings, such as flash or strobe. They only Small available currently in the uk! Or for something more sophisticated…. 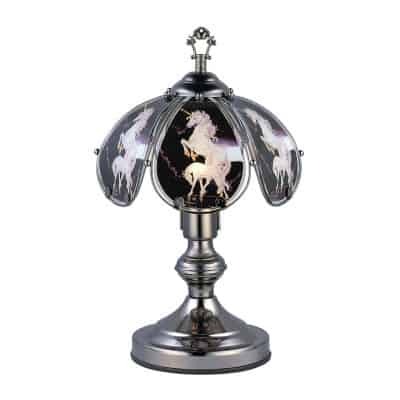 A beautiful unicorn table lamp (US) – that you only have to tap to switch off! 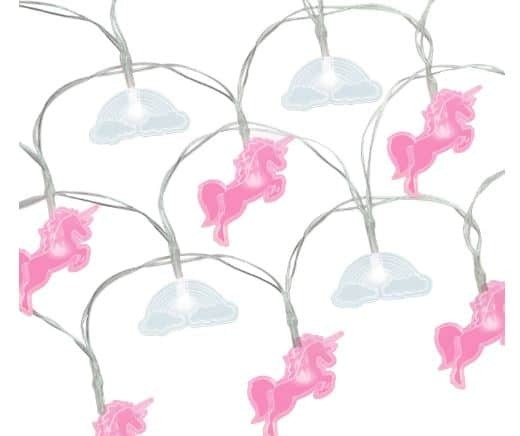 I do love the effect string lights can have in a room, check out these pretty Unicorn string lights here. I also did a previous post dedicated to string lights here. Ok…. so, this one may be a little, (or a lot) over the top. Depending on your child’s age, whether preschool or teen, there is certainly scope for creating a Unicorn themed bedroom – I hope this post inspired you to get started on your own project. Are you a big Unicorn fan too, as well as your child? Then it makes it all the more fun buying things for them doesn’t it? 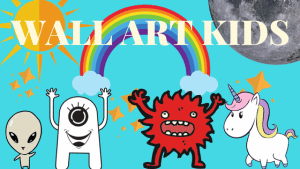 If your child loves Unicorns, ETSY has some cute stuff you may want to check out. I didn’t know there were so many unicorn items out there. And these actually look top quality. We are trying to do something special for my daughter, for her birthday. These are great ideas. And I don’t have to have unicorns popping up all over my browser history… I might even snag that Pug unicorn pillow for myself. Thanks for the info! My sister was really into unicorns when we were kids – she would love this post, I’ll be sure to pass it on! Thanks for featuring my cushion! Hi thanks for your comment! 🙂 You’re welcome, I hope you have fun decorating your daughters bedroom. 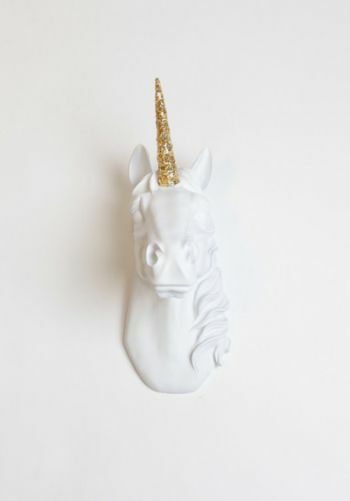 These unicorn-based bedroom items are not something I’ve came across especially lamps and string lights. Actually, these items are the ones I would like to single out as being the most appealing. Well, not for me but for my nieces. She is a toddler and I would to show these to her. Well, if I show the whole post, I think she is drawn more into the unicorn pillows because of their cheerful and friendly-oriented expression. 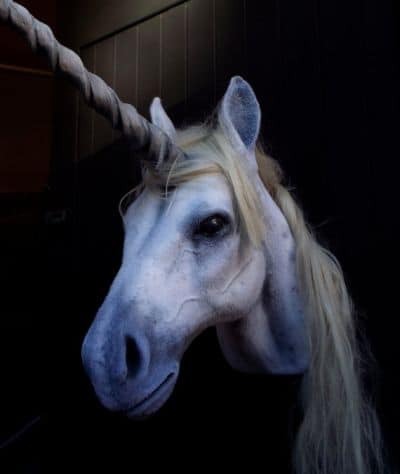 Hey there – yes Unicorns are extremely popular. The pillows you mentioned are really popular as well, people love them – and so do I! 🙂 I hope your niece sees something she likes. Thanks for your comment!